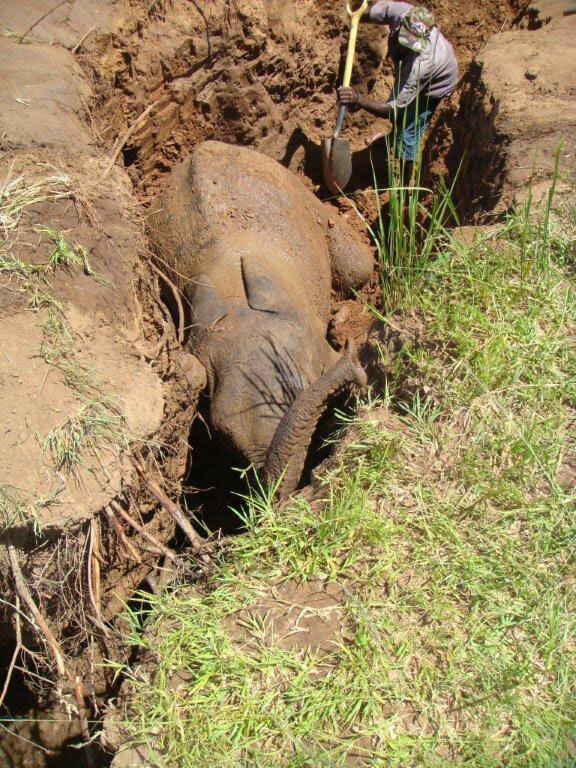 Three days ago we received a message from two compassionate local fishermen who reported that they had seen an elephant stuck in a gulley the day before whilst on their way fishing. 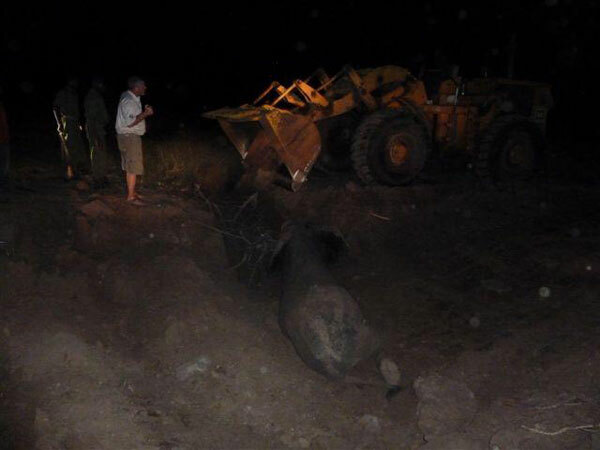 The elephant was still stuck the next day and the herd had left him so they decided to come and tell us. 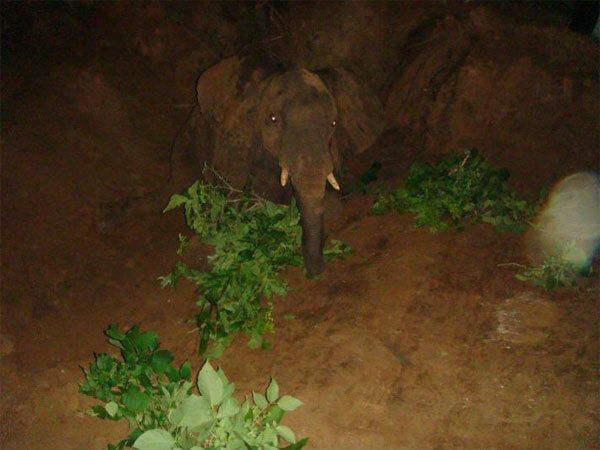 We jumped in our vehicle with the two fishermen and a scout and went to find the elephant about half an hour from our base. He was so tightly wedged in I knew immediately it would be a huge challenge to get him out. 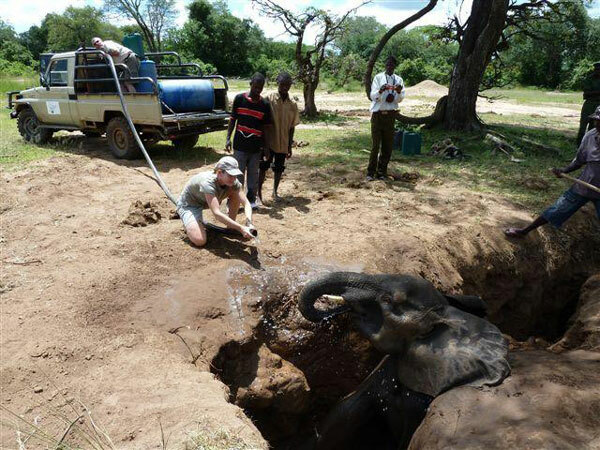 The elephant was severely dehydrated and hungry, having not eaten or drunk in three days and exposed to the hot sun under extreme stress. After getting extra manpower, water and tools and transport from a neighbor and good friend Steve Tolan, we immediately watered him down to cool him, gave him electrolytes and water to drink which amazingly he took right away without the fear of us giving it to him via a pipe. He easily drank about 80 litres. Later on in the day we managed to get him to eat a little too. We then started the process of digging around him trying to free his back legs which were tightly wedged. We spent the next eight hours or so trying to free him unsuccessfully, until we managed to get hold of a front end loader during the night. Working until midnight, we carved out a flat surface that would eventually allow us to pull him level on to his side. Unfortunately by that stage he was so exhausted and stiff from being stuck in one position he could not stand or use his back legs. We were kindly assisted with a TLB from one of our donors, Mfuwe Lodge to try and help him on to his legs and support him. Unfortunately this did not help him either and he had experienced too much muscle damage from lack of blood circulation over the past few days. His urine had also started turning almost black at this point indicting kidney failure. 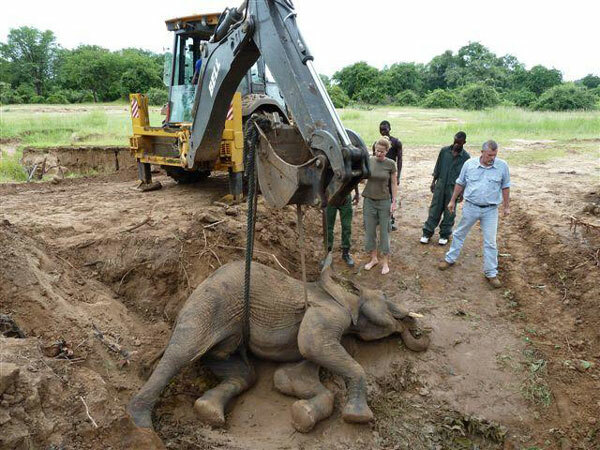 The elephant had been exposed to so much stress and suffering and had little if any chance of ever recovering and so the decision was made to euthanize him. 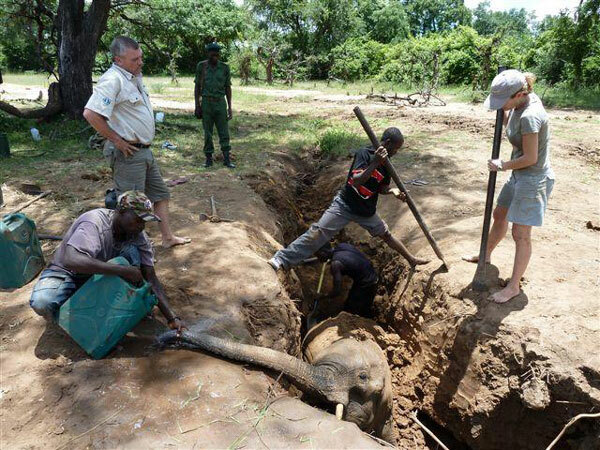 The challenges of rescuing wildlife in such conditions remain extremely challenging but the support and care offered by different individuals makes it easier and we thank everyone for it.